What Else Can I Expect From a Master's in Nursing Program? Affordability is a key concern for many students who apply to and enroll in online master of science in nursing (MSN) programs. It's important, however, to look beyond the cheapest online MSN programs in terms of tuition and fees. There are many affordable online MSN programs available that will provide true value and a return on the investment of time and money. Accredited online programs are designed to prepare graduates to work as managers, policy experts, or educators in the field. An MSN degree is also a required prerequisite for some doctoral programs in nursing education. Many graduate-level nursing students are registered nurses (RNs). Some MSN programs, however, admit students with undergraduate degrees in other fields. These students from other backgrounds are usually required to take additional entry-level nursing courses. Coursework in online MSN programs covers a variety of topics, including healthcare ethics, health care policy, advanced practice nursing, biochemistry, and pharmacology. Additionally, online MSN students pick a specialty in the field, such as health care leadership, nurse-midwifery, gerontology, pediatrics, or psychiatry. The flexibility of online coursework allows students to continue working as RNs or as full-time professionals while they earn their degree. In the interest of helping students evaluate the most affordable online MSN programs, we use our College Affordability Score methodology to rank programs based on several factors, including financial aid opportunities, the number of students who take out loans, graduation rates, and loan default rates for graduates. The list below is not a ranking of schools by lowest tuition rate; that is, they're not necessarily the "cheapest" online MSN programs. Instead, our rankings reflect the overall economic value these colleges offer online MSN students. Allen College offers one of the most affordable online MSN programs available. The master’s in nursing program includes concentrations in leadership in health care delivery, nursing education, community/public health nursing, and a variety of nurse practitioner tracks. About 25 students are admitted during the fall, spring, and summer semesters. Most tracks require students to earn at least 36 credits and complete clinical hours in a healthcare setting. Programs can be completed in one to two years. Coursework is delivered asynchronously through Blackboard, but all students must meet face-to-face requirements at the Waterloo, Iowa, campus in order to complete their MSN degree. The program is offered in a full-time and part-time format. No standardized tests are required for admission. Students do not need clinical experience in order to apply, but they should have at least one year of clinical experience by the time they take master’s level clinical courses. Vanderbilt University’s MSN in healthcare leadership program, one of the best online master's in nursing, can be completed entirely online. The school has an on-campus hospital. Online graduates are prepared for management roles, leading the delivery and administration of nursing and healthcare services, and they typically find work in hospitals, clinics, and corporations. The curriculum focuses on contemporary nursing knowledge and includes case studies. Learners are required to complete a 490-hour practicum experience. Coursework is delivered asynchronously, with students using discussion boards to interact with faculty and peers. The program can be completed in one year, and part-time students can start in the fall or spring semester; full-time students are only offered a fall start date. Students take a planned set of courses each semester, progressing in a linear fashion. The program requires students to earn at least 39 credits. It is one of the more selective online MSN programs, as only 5-15 learners are admitted each year. The University of Texas Medical Branch offers an online master’s in nursing program with seven different tracks, including four nurse practitioner options and leadership and educator options. All tracks are offered completely online and taught asynchronously. The executive nurse leader option has a different core curriculum than the others, which includes courses in community health practice, foundations of theory and research, and pharmacology. Students may transfer up to 12 credits. All students must be CPR certified. The program includes a required practicum experience. UTMB can help arrange practicum locations in the Houston/Galveston area; if online students do not live in the area, they must arrange a practicum themselves and acquire approval from the school. Most programs take about seven semesters (or a little over two years) to complete if students take at least two courses per semester. Thomas Edison State University, located in Trenton, New Jersey, offers an affordable online master’s in nursing program with three separate concentrations: nurse education, nursing informatics, and nursing administration. Each concentration requires students to earn at least 36 credits and take a relevant seminar and practicum within the concentration. Twelve credits are core credits that are common to each of the concentrations. Part-time students can complete the program in three years. All applicants should have a minimum undergraduate GPA of 3.0 and at least two years of clinical nursing experience. One of the more unique elements of the school's program is the MSN e-portfolio. As students complete coursework, they compile their best work. The e-portfolio contains documents, assignments, and presentations. Students turn it in after their final nursing course, showcasing their professional development, growth, and capabilities. Texas Tech University Health Science Center’s MSN education track prepares its graduates for careers in nursing education. The program requires students to complete at least 42 credits. Students take asynchronous courses that are completely online. A practicum experience is required, and the program leads to positions in academic and practice settings. All applicants to this online master’s in nursing program should have a minimum undergraduate GPA of 3.0, an unencumbered RN license, and professional nursing experience. Students may begin the program in the fall or spring terms. The program includes a required nursing core of 27 credits, and 15 credits in the nursing education specialization. Nursing education coursework includes teaching and technology integration, curriculum development, and assessment and measurement. The final two courses are the practicum and a comprehensive care survey. Stony Brook’s MSN education program, an online master’s in nursing program that focuses specifically on nursing education, is offered through a blended cohort model. The program is largely online with required, in-person “immersion experiences." The curriculum contains synchronous and asynchronous elements. Students move through the program with the same group of peers. All applicants should have a professional RN license, an undergraduate GPA of at least 3.0, and undergraduate coursework in health assessment and statistics. The program requires the completion of 45 credit hours. This includes a 26 hour nursing core with coursework in areas such as pharmacology, health assessment, research, and pathophysiology. Students with a non-nursing bachelor's degree may apply, but they must submit a clinical practice portfolio. Graduates are prepared to teach in schools and clinical settings. The University of Hawaii at Manoa offers a master’s degree in advanced population health nursing program that differs from most online MSN programs. Students learn how to manage entire health populations, including community and population assessment, disaster nursing, and health services research. The program requires 30-39 credits. Full-time students can complete the program in a little over a year, while part-time students usually take about two years to finish. The program is offered completely online and delivered asynchronously. All applicants must possess an active RN license and must have earned an undergraduate GPA of at least 3.0. The curriculum is 30 credits. If students choose to complete a thesis, they complete an additional nine credit hours. Coursework is globally focused, including options in global health, emerging diseases, and epidemiology for advanced nursing. University of Maryland Baltimore’s online MS in nursing informatics program focuses on data and electronic information systems as they pertain to health. The degree is offered entirely online and delivered asynchronously. Students have the option of completing the 40-credit degree full-time or part-time. Full-time students usually finish the degree in five semesters, while part-time students usually take seven to eight semesters. The University of Maryland School of Nursing is a member of the Academic Common Market, so online students who reside in certain southern states can pay in-state tuition if there isn’t a nursing program in their home state. Coursework includes four core courses, two leadership management courses, and seven courses in informatics, including a practicum in nursing informatics. Students can enter the program in either the fall or spring terms. The University of Central Florida, located in Orlando, has an online nursing MSN program that provides nationwide access. The general master’s in nursing online program includes three tracks: nursing leadership and management (NLM), nurse educator (NE), and nursing and health care simulation. Credit requirements vary by track, but students must earn 30-38 credits. All students must complete three prerequisite courses: dimensions of professional practice, public health nursing, and nursing research. Students can enter the NLM track during the fall or spring terms and the NE track during the fall, spring, or summer terms. Full and part-time students are welcome. Coursework is completely online and delivered asynchronously. Students must visit the Orlando campus during two occasions: orientation and the presentation of the master’s evidence-based project. The project is a capstone experience that students in all three tracks must complete. Each track also includes internship and residency options. Excelsior College’s master’s in nursing online program in nursing leadership and administration is designed for working professionals in the nursing field. The program is offered completely online and coursework is asynchronous. Course topics include information management, new healthcare technologies, supportive work environments, and budgets and funding. The program is divided into three phases. Phase I requires 20 credits, phase II requires 12 credits, and phase III requires 6 credits, totalling 38 credits. Phase I includes basic nursing core courses, such as foundations of nursing, policy, and research. Phase II is the nursing leadership and administration component, which includes management and leadership coursework. Phase III is the capstone; it provides learners with real-world experience. Transfer credits with a minimum grade of B- are accepted on a case-by-case basis. The program is accredited by the Accreditation Commision for Education in Nursing. California State University - Chico’s online MSN program is designed for nurses in a rural setting. The program is taught through a part-time, cohort-based model that includes synchronous and asynchronous elements. Students take six credit hours each term over five semesters, moving through the curriculum with the same group of peers. The 30-credit program does not require a thesis. The program offers two tracks: nurse educator and nursing leadership. Students begin the program during the fall semester. All applicants should have completed the GRE with a writing score of at least 3.5, have earned a minimum undergraduate GPA of 3.0, and have a current California RN license. The University of Iowa’s MSN: clinical nurse leader prepares graduates for leadership roles in clinical settings, creating experts who focus on improving the quality of an institution’s patient care ability. The 39-credit program is delivered almost entirely online, with the exception of the health promotion and assessment for advanced clinical practice course, which requires on-campus time in Iowa City. Students also travel to campus for orientation and to present their capstone projects at the conclusion of the final semester. The program follows a specific schedule, which includes six semesters and one winter session. The curriculum is taught through a cohort format, and most classes are synchronous. Applicants should have an undergraduate GPA of at least 3.0 and an unencumbered RN license. The GRE is not required. Coursework includes a single practicum experience, leadership in the microsystem, which requires 90 clinical hours. Florida State University, located in Tallahassee, offers an online nurse leader MS program. This online master’s in nursing program is offered completely online and requires students to earn at least 32 credits, which generally take six semesters to complete. All coursework is completely online and asynchronous. The program is only offered to students living in Florida, and all students must complete their clinical experiences in the state. Applicants must submit GRE scores, two letters of recommendation, and a copy of their current Florida RN license. A BSN with a minimum GPA of 3.0 is also required. Students begin the program during the fall semester. Core nursing coursework includes pharmacology, pathophysiology, nursing research, management, health care and organizational change, and technology. Learners have up to seven years to complete the program. Graduates are prepared for various clinical settings. Georgetown University’s School of Nursing & Health Studies offers a range of affordable online nurse practitioner MSN programs. Offerings include adult gerontology acute care nurse practitioner, family nurse practitioner, and women's health nurse practitioner. All courses are delivered live, and each program begins in the fall and is taught through a cohort format. In-person components include a practicum and on-campus intensive learning immersions (OCI), which are clinical training experiences. All programs require a nursing core. The AG-ACNP program prepares students to provide direct patient management. Its requires 40 credits and takes about two years to complete. The FNP curriculum requires 44 credits and can be completed in 19 months. Graduates are prepared to care for families in a primary care setting. WHNP students learn how to provide care for women over the lifespan. They are prepared for primary, reproductive health, and lifespan care settings. The University of Colorado Denver’s iLEAD (innovation in leadership and administration in nursing and healthcare systems) MS in nursing with a concentration in health care informatics program allows graduates to transition seamlessly into a phD program. Students can try the program before committing. They have the option of taking up to 12 credits as a non-degree student before being accepted; non-degree students are not eligible for financial aid. Courses include theory in nursing, health systems and policy, APN research methods, and multiple chronic conditions. All students pay in-state tuition. The program requires students to earn at least 30 credits. It's among online MSN programs that allows learners to complete an additional 12 credits to earn a specialization in executive leadership or healthcare informatics. Students may also choose to have their degree title include “healthcare systems.” The curriculum includes an optional two-credit (90 hours) administrative internship. Towson University offers a master’s of science in nursing online program that offers two concentrations: nursing education and clinician-administrator transition. Each program requires students to complete at least 36 credits. This includes 21 hours of core courses and 15 hours in the concentration. Both concentrations are intended to prepare students for leadership or education positions in communities. Courses include the adult learner, a teaching practicum, and evaluation in nursing education. The programs are offered in a hybrid format, and students have the option to earn their degree part time or full time; full-time students are part of a cohort. Coursework is delivered synchronously. Applicants must have earned an undergraduate GPA of at least 3.0, possess a Maryland RN license, and have at least one year of work experience as a registered nurse. Western Governors University's nursing degree is unique among online MSN programs. The school uses competency units (CU) to measure success instead of credits. WGU’s program is completely online and asynchronous. The program is designed for RNs who hold a bachelor of science in nursing. The school's MSN in nursing education program requires the completion 36 competency units. Most students finish the program in less than three years. Learners have the option to finish at a faster pace; WGU allows students to take a larger course load. Graduate students must complete at least eight CUs every term. Coursework covers research, pharmacology, and policy. A capstone experience is required; the project addresses a need or issue in the field and integrates learned knowledge. Applicants must have an unencumbered RN license. Graduates are prepared for careers as professors, clinical nurse educators, staff development officers, and more. Johns Hopkins, located in Baltimore, is renowned for its hospital and medical school and offers one of the best online MSN programs. The school’s MSN program offers concentrations in adult/gerontological health, adult/gerontological critical care, pediatric health, and the featured clinical nurse specialist. Applicants must have a minimum undergraduate GPA of 3.0, a BS in nursing, and a year of clinical nursing experience. Students may transfer up to six approved credits. The clinical nurse specialist track is offered on campus and completely online. The program requires students to complete at least 38 credits. This includes core, advanced practice, and specialty courses. Specialty courses include health promotions and disease prevention, human and family development through the lifespan, and program evaluation and development in healthcare. Full-time students can graduate in four semesters, and part-time students can graduate in seven semesters. George Washington offers an RN to MSN bridge program in addition to four separate MSN tracks: adult-gerontology primary care nurse practitioner, family nurse practitioner, nurse-midwifery, and nursing leadership and management. The nurse-midwifery concentration is a collaboration between GW and Shenandoah University. Each program shares common courses and requires a minimum undergraduate GPA of 3.0 and a nursing license. Students can complete the concentrations through full or part-time study. The school offers fall and spring entry. Credit requirements vary by concentration. The adult gerontology concentration requires 48 credits and the nursing leadership concentration requires 36. GW’s online MSN programs differ in terms of how much on-campus work is required. Nursing leadership and management is completely online, only requiring attendance at a virtual new student orientation. Adult gerontology and family nurse practitioner requires 700 clinical hours in addition to immersive campus learning, skills intensives, and objective structured clinical examinations. In addition to RN to MSN tracks that can be completed within 30 months, Nebraska Methodist College offers a variety of affordable online MSN programs, including nurse educator, nurse executive, and nursing informatics. Each program takes about 21 months to complete. Coursework is completed asynchronously and entirely online. Courses last either five or 10 weeks, with a one week break before the next set of courses begin. Executive courses include community health nursing, issues in advanced nursing, and organizational behavior and structure. Depending on degree path, students must earn 36-54 credits in combination with undergraduate bridge coursework. Students should have a bachelor's in nursing, a minimum undergraduate GPA of 3.0, and an unencumbered RN license. All programs are offered part-time and designed for working nurses. There is no nursing core at Nebraska Methodist; each track contains unique coursework. Michigan State University’s MSN program is unique among online MSN programs because it focuses on two specific areas of nursing: adult gerontology clinical nurse specialist and nurse education concentration. Graduates are prepared to serve as clinical nurses in the adult gerontology field and to educate other nurses. Students must complete between 47 and 51 credit hours. Applicants should have at least a 3.0 GPA for the second half of their undergraduate studies, possess a valid RN license, and have a BSN degree. Coursework includes internship, immersion, and teaching experiences, in addition to broad nursing coursework. Coursework is delivered completely online through the D2L platform. Students in the program must attend a one-day, on-campus orientation in East Lansing. There are full-time and part-time tracks; full-time students finish in six semesters (two years), while part-time students finish in eight semesters (about 32 months). Mount Carmel College of Nursing’s MSN in nursing education program prepares students for a number of roles beyond education, equipping them with the ability to design nursing curricula. The program requires the completion of 34 credits, and students may only enter in the fall semester. The program only offers a part-time option, which takes three years (seven semesters) to complete. Students take a specific sequence of courses through a cohort format, completing synchronous classes with their peers. The program includes a practicum and a leadership and scholarly writing course. Applicants should have earned at least a 3.0 GPA during their undergraduate work, and should have at least one year of clinical nursing experience. Mount Carmel is among online MSN programs to require applicants to complete an interview before being accepted. California State University - Dominguez Hills offers an online MSN program with four different concentrations: administrator, educator, clinical nurse specialist, and family nurse practitioner. Each track requires the completion of 30-36 credits. Each concentration also includes a 15-credit MSN core. One of the unique aspects of the program that differentiates it from other online master’s in nursing programs is its capstone experience, the Professional Portfolio/Presentation. Students must demonstrate their mastery of objectives by creating a professional portfolio and presenting it orally, along with a PowerPoint presentation. The portfolio and PowerPoint are submitted through Blackboard, and the presentation is done through a conference call. The entire program is asynchronous and online, with no on-campus visits. 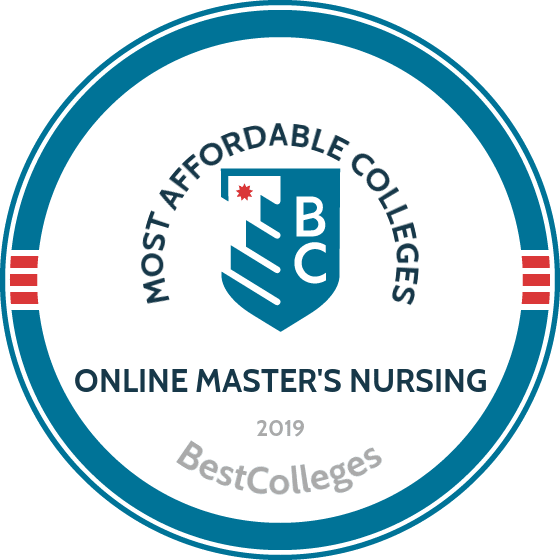 Texas Woman’s University's affordable online MSN program in nursing education is offered completely online and admits students in the fall and spring semesters. The curriculum includes a practicum experience that is coordinated with organizations near the student. Material is delivered asynchronously. The program requires students to earn at least 40 credits. Applicants must have earned a minimum 3.0 GPA over their last 60 credits of undergraduate coursework and an unencumbered RN license. Undergraduate coursework in statistics is required. TWU is among online MSN programs that require GRE or MAT scores. Coursework includes a 20-credit core that provides a broad foundation in nursing, in addition to 20 credits in the nursing education specialty. Courses include measurement and assessment in nursing, curriculum design, and a teaching practicum in the field. There are no on-campus requirements. Tennessee Technological University offers a broad MSN program with an RN to MSN concentration. Unlike other online MSN programs, this is a bridge program, which is an accelerated curriculum that leads to an RN who holds a bachelor's degree in an unrelated field to their MSN. The program has a broad foundation. Students must earn 36-46 credits, depending on if students choose the family nurse practitioner, nursing education, or nursing administration concentrations. Each concentration includes a 12-credit core in basic nursing competencies. Students who already have their RN but don’t have a bachelor's in nursing must complete a 12-credit bridge to enter the program. The program is delivered asynchronously through a consortium of four different middle Tennessee universities, and clinical hours are coordinated with organizations close to each student. To enter an online master's program in nursing, you must hold a bachelor's degree. Most programs require an undergraduate degree in nursing from an institution accredited by the Accreditation Commission for Education in Nursing, the Commission on Collegiate Nursing Education, or a similar body. Some schools also require a valid license as a registered nurse. Professional experience requirements vary from program to program. Some schools cater to recent graduates, while others prefer applicants with at least three years of relevant work experience. Even when not required, experience as a nurse can improve your chances of earning admission into a master's program. Academic requirements also vary. Generally speaking, graduate schools of nursing look for candidates who maintain an undergraduate GPA of at least 3.0, though some programs conditionally admit students with a slightly lower average. Schools may also ask that you submit scores from the Graduate Record Examination, or GRE. GRE scores remain valid for five years. Nurse practitioners train to treat certain medical conditions without the supervision of a doctor. They may focus on caring for a particular population, such as adolescents or the elderly, or specialize in a particular area of health, like providing mental health therapy to patients. Public health nurses work to address issues of health and healthcare access, most often in communities underserved by private healthcare organizations. Generally, they work for either nonprofit organizations or government agencies. Students specializing in public health nursing often take coursework in both direct health service and program administration. The quickly evolving fields of nursing and healthcare need dynamic leaders. Nurses who choose a concentration in leadership and management often take courses in areas like planning, finance, human resources, and decision-making. They take on roles leading nursing departments and smaller healthcare settings. They may also act as consultants to multiple organizations. Many students seeking a master's degree in nursing hope to educate the next generation of healthcare providers. Through coursework in adult learning, curriculum development, and the integration of technology into the classroom, a concentration in nursing education helps them develop the knowledge and skills to become educators. Nursing informatics involves the enhancement of patient care through the use of technology. For example, students specializing in this area may learn how to develop patient databases that help improve the accuracy of diagnoses, eliminate redundancy in care, and lower overall cost. Students who choose this concentration often possess a strong academic or professional background in a field like computer science or information technology. Your exact course of a study in an online master's in nursing program varies depending on the electives and concentration you choose. However, five courses commonly offered in these programs appear below. Biostatistics: This course introduces students to the principles and practices of collecting and analyzing data for use in health-related contexts. Topics covered include probability theory, hypothesis testing, probability theory, confidence interval testing, and multivariable methods. This course helps lay a foundation for students pursuing a thesis option or who plan to continue their education and earn a doctorate in nursing. Healthcare Quality and Improvement: In this class, students explore the current healthcare environment in the United States, including its evolution over time, the impact of shifting demographics in the country, and potential solutions to pressing issues. The course also looks at how healthcare technologies can promote quality at the organizational and systemic levels. Advanced Nursing Concepts: Students in this course analyze the history of the nursing profession and various conceptual models and theories related to it. They apply these theories to real-world nursing situations through communication, critical thinking, and decision-making. They may also collect quantitative and qualitative data in a healthcare setting, aiding in future research projects. Advanced Pathophysiology: Building on undergraduate coursework in pathophysiology, this course explores the relationship between normal physiology and the changes caused by disease and injury, helping to enhance clinical reasoning skills. The course focuses on topics like pathogenesis, environmental influences, and the clinical manifestations of major health problems. Global Health and Diversity: Students in this class examine issues related to global healthcare delivery systems. They analyze political, financial, and social constraints on those systems and learn how to both work within those constraints and press for change when needed. This elective provides invaluable training for nurses who plan to work internationally. Most full-time students earn their online master's in nursing in about two years. However, several factors can affect the amount of time it takes to earn your degree. For example, if you did not earn a bachelor's degree in nursing, programs require that you complete this coursework before you enroll in graduate-level classes. If you plan to study on a part-time basis so that you can remain in your current job, you may need up to four years to complete your program's graduation requirements. Some self-paced programs do allow you to earn your degree in less than two years. On these accelerated tracks, students can advance through their course material as soon as they demonstrate mastery of the core concepts. While graduating sooner appeals to working professionals, remember that self-paced programs do not offer the same level of support as more traditional, cohort-based master's program. Nursing requires a wide range of skills and deep expertise in a variety of content areas. To succeed as a nursing professional, you need to hone all of the skills listed below. As the primary monitors of their patients' health, nurses must know when to take corrective action to address a change in a status. For example, a nurse may need to make the call to transfer a patient to emergency care if their condition rapidly deteriorates. Nurses must know how to explain medical conditions and proposed treatments to patients and their families. They must also communicate with doctors, explaining patient concerns and needs that may influence care. Especially in larger organizations and urban settings, nurses may work with dozens of patients. Keeping track of charts, medicines, and schedules requires exceptional organizational skills and tremendous attention to detail. Nurses sometimes see patients before doctors, meaning they often form the first opinion of a patient's illness or injury. To diagnose and convey this information accurately, nurses must possess expertise in pathophysiology. Nurses often must provide emergency care, necessitating training in basic life support, advanced cardiac life support, cardiopulmonary resuscitation, and other first-responder techniques. This kind of training often makes the difference between life and death. Most master's in nursing programs do not require an internship or practicum, as students have already completed one during their undergraduate studies. Instead, students can complete either a research-based thesis or a more practice-oriented capstone project as a culmination of their graduate program. On a thesis track, students collect and analyze data from a healthcare setting and document their findings in a research paper. While some students conduct original research, others may use an existing data set or combine data from multiple sources. Students often work closely with a faculty adviser when writing their thesis. On a capstone track, students take a course near the end of their studies that allows them to apply their learning to an actual issue in nursing. For example, they may partner with a local hospital to examine its nurse staffing policy and make a recommendation for how to meet the needs of patients. Registered Nurse License: Registered nurses must hold a license to practice. To receive a license, you must graduate from an accredited nursing program and pass the National Council Licensure Examination for registered nurses. Additional requirements vary from state to state, but often include a criminal background check and an application to a state board of nursing. Neonatal Resuscitation Nursing Certification: Dozens of voluntary certifications exist within the field of nursing. Neonatal resuscitation certification ensures that a nurse possess the skills necessary to provide emergency care to infants, especially premature babies. This certification can help you qualify for jobs in obstetrics and requires passing both a training course and an exam. Advanced Oncology Certified Nurse Certification: This certification signals expertise in caring for patients with various forms of cancer. Many healthcare employers look for an oncology certification when hiring nurses for both home and hospital care positions. To qualify, you must complete 1000 hours of work in a field related to oncology, pass an exam, and earn continuing-education credits to remain certified. What are RN-to-MSN Online Programs? RN-to-MSN online programs allow students to earn both a bachelor's degree and a master's degree in nursing, often in less time and for less money than earning these two degrees separately. Generally speaking, applicants to these programs hold an associate degree in nursing or a diploma from an approved nursing program. Before entering an RN-to-MSN online program, you must possess a license as a registered nurse. Admission requirements for these programs closely resemble those of bachelor's programs in nursing. Schools may require you to maintain a minimum GPA in your undergraduate nursing classes before you enroll in graduate-level courses. Students who want to continue their education and pursue a master's degree often take on roles as nurse leaders, nurse educators, or nurse practitioners after graduating. If you hope to continue working while completing coursework, make sure that your online RN-to-MSN program allows for part-time study. How Long Do Online RN to MSN Programs Take to Complete? The amount of time it takes you to earn your RN-to-MSN online depends largely on your level of education entering the program. For example, if you hold an associate degree in nursing, you can complete all of the requirements for both a bachelor's and master's degree in just four years of full-time study. Part-time students, or those without any undergraduate credits, may need six to eight years to earn both degrees. Many career paths exist in the field of nursing. You may want to provide general care to your patients as a registered nurse. You may want to specialize in obstetrics, working as a nurse midwife to aid mothers during pregnancy and labor. You may want to take on greater levels of responsibility as a nurse practitioner, diagnosing and treating patients without the supervision of a doctor. Or you may hope to share your knowledge and passion for healthcare with aspiring nurses, working as a nurse educator. Registered nurses provide care to patients in a variety of healthcare settings, including hospitals, nursing homes, and health clinics. They may also educate the public about health issues, provide advice to patients and families dealing with chronic illnesses, and consult with doctors and other healthcare professionals. Nurse anesthetists provide anesthesia to patients preparing for surgery and other major medical procedures. They also provide care to patients as they recover from the effects of anesthesia. You must hold a master's degree and complete coursework in this area to qualify for a position as a nurse anesthetist. Nurse midwives offer care to pregnant women, such as gynecological exams, family planning advice, prenatal care, and support both during delivery and after. Some nurse midwives provide wellness education during infancy. You must hold a master's degree to take on this role. Nurse practitioners receive specialized training that allows them to diagnose and treat certain medical conditions without the supervision of a licensed doctor. They may act as primary care providers or focus on a particular area of health, such as geriatric care. Postsecondary teachers work at colleges and universities instructing students and conducting research. While most of these jobs require a doctorate, nurse educators often qualify for academic positions with just a master's degree. According to the BLS, the median registered nurse earned $70,000 per year in 2017. The lowest 10% of registered nurses earned less than $48,690 that year, while the highest 10% of earners brought in more than $104,100. Earning a master's degree can qualify you for more advanced positions and higher salaries. For example, the BLS estimates that the median nurse anesthetist earned a staggering $165,120 in 2017, more than four times the median salary for all other occupations. The table below uses data from Payscale to illustrate potential earnings over the course of five different careers in nursing. According to the American Association of Colleges of Nursing, nearly half of all nurses employed in the U.S. work outside of a hospital setting in places like schools, homes, and private businesses. After you earn your online master's in nursing, think carefully about what kind of work environment fits your professional goals. Recent graduates may also consider relocating for a job, as the demand for qualified nurses varies considerably from state to state. Nursing Homes: Nursing homes, also known as assisted-living facilities or convalescent homes, provide 24-hour nursing care for the elderly, disabled, or chronically ill. In addition to coordinating medical care, nurses who work in these settings must perform administrative tasks related to the housing, feeding, and socializing of their patients. Nurses who prefer to develop closer and long-term relationships with their patients may seek out jobs at nursing homes and other extended-care settings. Schools: School nurses provide healthcare services to students. The type of care provided depends greatly on the educational setting in which the school nurse works. For example, a nurse employed by an elementary school can expect to deal largely with minor injuries and infectious diseases common among juveniles. A nurse working at a high school may also need to educate students on issues of sexual health and substance abuse. Nurses working at colleges or universities may need to offer or coordinate family planning and mental health services for their students. Businesses: Many private businesses employ nurses and other healthcare professionals to offer more convenient care for their employees. For example, a construction firm may keep a nurse on staff to respond to minor job-related injuries that do not require a visit to the hospital. Nurses in these roles may also perform a variety of healthcare services for their colleagues, such as administering flu vaccines, offering regular check-ups, or leading a program to help employees quit smoking. Corrections: The logistical challenges associated with bringing incarcerated individuals to a hospital or health clinic means that correctional facilities often hire nurses to work on staff and provide on-site care. Nurses working in jails, prisons, and rehabilitation centers must know how to treat illnesses and disease, respond to emergency situations, and assist individuals with mental health issues arising from their imprisonment. After completing a BSN-to-MSN online program, you should consider joining a professional organization for nurses. These groups provide a wealth of resources to help you advance in your career, including local and national networking events, online and in-person professional development opportunities, and mentorship programs. Many associations also host job boards and provide guidance to both recent graduates and established professionals looking to change directions in their career. Founded in 1896, ANA represents more than 4 million registered nurses working in the United States. The association establishes standards and codes of ethics for the field, advocates for more effective healthcare policy, offers continuing-education resources to its members, and organizes networking events and research convenings. AANP represents nurse practitioners qualified to diagnose and treat medical conditions without the supervision of a doctor. The association uses national conferences, affinity groups, and regional chapters to help its more than 240,000 members network and collaborate. The Academy works to advance the nursing profession by promoting organizational excellence and effective nursing leadership. Through public education programs and expert testimony, the organization plays a key role in advocating for health equity. Since 1971, NBNA has supported the professional interests of African-American nurses. The association publishes a scholarly journal, hosts online training opportunities, awards scholarships to both aspiring and established nurses, and administers a career center. NSNA specifically serves students on the path to a career in nursing. In addition to scholarships, networking opportunities, and a job board, the association provides invaluable advice to students preparing for licensure exams and to those considering graduate-level education. Students should first fill out the Free Application for Federal Student Aid (FAFSA). Completing the FAFSA determines your eligibility for federal grants, work-study opportunities, and low-interest student loans. States typically also use the FAFSA to award need-based aid to both undergraduate and graduate students. Many states and private organizations also provide financial aid specifically to students pursuing a career in nursing. For example, certain states forgive student loan debt if you agree to work for a certain number of years in a high-need healthcare setting. Who Can Apply: Applicants must be registered nurses enrolled in a master's or doctoral program in nursing education. Students must also attend school and pledge to work within regions of high need. The foundation offers awards based on academic excellence, established financial need, and commitment to the profession. Who Can Apply: This scholarship serves registered nurses currently seeking their master's or planning to enroll in an accredited master's in nursing program. Applicants must be members of AANP. The association offers awards largely on the basis of academic achievement. Who Can Apply: This program draws men into the field of nursing. Applicants must pursue a master's degree in nursing and be a member of the AAMN. Recipients must also agree to make a 15-minute presentation at the AAMN national convention. Who Can Apply: To receive this award, you must pursue an advanced degree in nursing with a concentration in oncology. The program caters to international applicants attending accredited institutions, and recipients may qualify to receive up to two years of funding at $10,000 per year. Who Can Apply: Administered by the Health Resources and Services Administration, this program addresses the critical shortage of nurses. Applicants must pursue a degree in nursing and commit to work in an underserved community. The program awards scholarships based largely on financial need. Who Can Apply: The ENA foundation awards scholarships to aspiring emergency nurses pursuing associate, bachelor's, master's, and doctoral degrees. To apply, you must submit academic transcripts, a professional resume, a personal essay, and letters of recommendation. The foundation prioritizes individuals with a strong record of academic excellence and financial need. Who Can Apply: This program serves nurses pursuing an advanced degree. Applicants must hold a bachelor's degree in nursing, complete at least 12 credits of a master's program by the time of application, and maintain at least a 3.6 GPA in their graduate studies. Applicants must also hold a registered nurse license. Who Can Apply: This scholarship program supports nurses pursuing a graduate degree in either maternal or child care. Applicants must be a registered nurse and a member of a nursing organization partnered with the March of Dimes. The March of Dimes Foundation offers awards based primarily on academic achievement.